Praise and rejoice in the Lord with a variety of liturgical music from Unity Award winner Tom Kendzia. "I have tried over these 30-plus years to offer music for worship that is easy to sing communally, and at the same time, musically interesting for church musicians to perform." Serving the needs of liturgy, as well as faith formation, Tom has the unique ability to craft songs that inspire worshipers of all ages. From pieces for gathering, communion and sending forth to psalm settings and songs for youth and young adults, this collection provides a variety of music to sing God's praises. "Live the Message" is a simple call to accept the challenge of following Christ—including vocals from longtime friend and collaborator ValLimar Jansen. Featuring powerfully visual texts from Rory Cooney, "One in Love" exhibits the living God fully alive in each of us. Tom also provides a revised "Exsultet," updated with texts from the new Roman Missal. Whether you lead with a single piano and cantor or with a full contemporary-style band and choir, the Like a River octavo packet provides you with the vocal and instrumental arrangements you need to share these songs with your community. This is the MP3 playlist for Like a River. Whether you lead with a single piano and cantor or with a full contemporary-style band and choir, the Like a River octavo packet (coming soon) provides you with the vocal and instrumental arrangements you need to share these songs with your community. 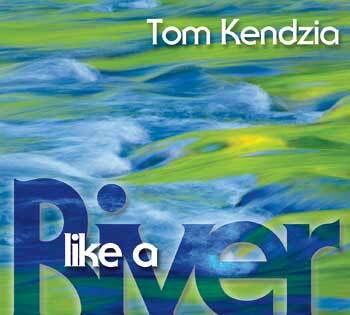 Celebrate the living God in each of us with Tom Kendzia’s incredible gifts and unique ability to craft songs that inspire worshipers of all ages. With an upbeat, inspiring and modern style, Like a River speaks to us all with messages of love and faith that are sure to raise spirits and ignite the faith of your assembly. The driving beats and up-tempo rhythms of "Live the Message" call out to us to accept the challenge of following Christ and include vocals from longtime friend and collaborator ValLimar Jansen. Featuring powerfully visual texts from Rory Cooney, "One in Love" exhibits the living God fully alive in each of us through it’s smooth melodies and warm vocals. With pieces for gathering, Communion and sending forth, psalm settings and even songs for youth and young adults, this collection provides a variety of music that inspires your assembly to lift their voices in praise to the Lord.